The jubilant Gunnison Valley High softball team clears the dugout and races into the infield after winning the state 2A championship. 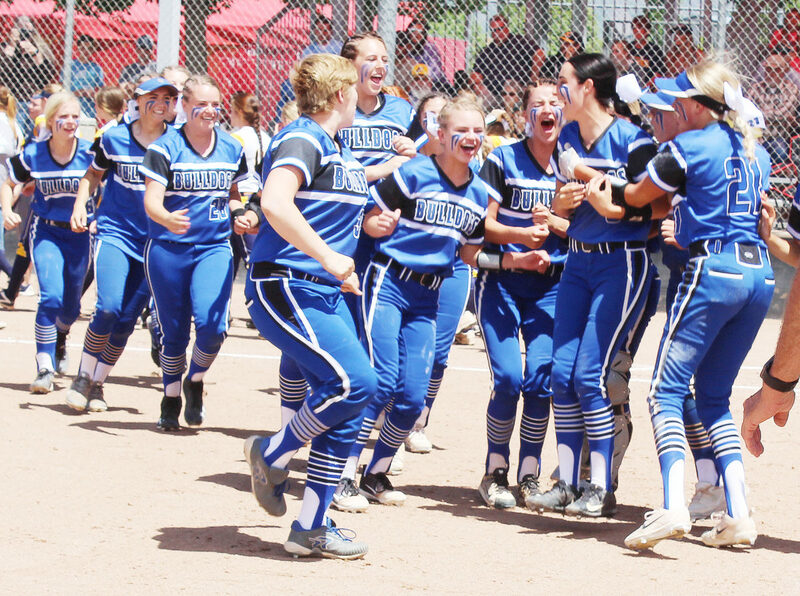 SPANISH FORK—The key to Gunnison Valley taking state in softball over the weekend and bringing home the first championship in a girls sport in 39 years was pretty simple. It was home runs. 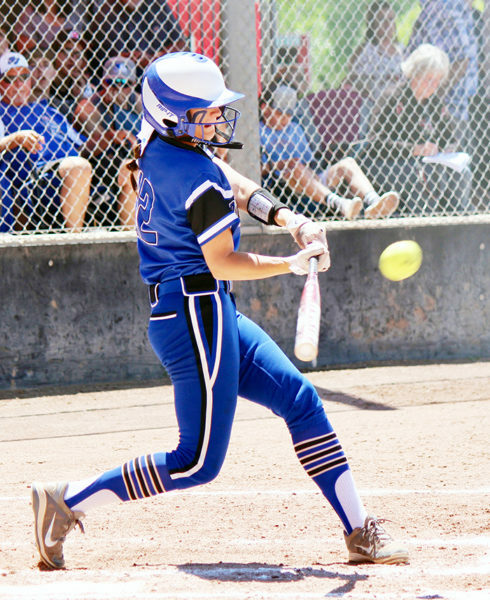 In beating Enterprise High School of Washington County, 12-2, last Saturday, May 19, at the Spanish Fork Sports Park, the Lady Bulldogs hit five of them. The homers were distributed throughout the game. There were two in the second inning, two in the third and one in the fourth. All told, the home runs accounted for nine of Gunnison’s 12 runs. “They came to hit today,” coach Tyson Brackett declared as the celebration in the infield started to die down. This hit by Mckaylyn Edwards in the fourth inning with a runner on base went over the fence to score Gunnison’s 10th and 11th runs. Home runs proved to be the key to Gunnison’s 12-2 victory over Enterprise. The victory capped a remarkable effort that actually stretched back four years to when many of the players were in middle school, Brackett explained in a later interview. In 2013, Walter Jones of Manti organized a community softball team. Brackett’s daughter Emily, the winning pitcher in the championship game, was on the team. The next year, Brackett said to himself, “Let’s see what these girls can do.” He organized a team in Gunnison called “Mayhem.” The team played 95 games in one season and won more than 60 of them. “We went to a tournament every weekend,” he said. Other community teams followed. The girls did well in games, “but it was between the games that they developed the relationships” that helped them weld together as a high school team. During the regular season this year, the Lady Bulldogs posted a laudable 18-7 record. But when they got to the state tournament, they caught fire, scoring 68 runs in five games. In an opening “inter-region game,” they beat St. Joseph, a Catholic high school in Ogden, 18-0. In the first round, they defeated Altamont, of Duchesne County, 19-2. Then, in the quarterfinal game, they faced Enterprise, which had advanced by defeating North Sevier. There was a two-hour lightning delay at the Spanish Fork Park that day. While the Gunnison girls waited to play, they gathered near their bus in the parking lot and started dancing. Pretty soon, players from Cedar, Enterprise, Manti and Carbon were joining in. “They had a dance off,” Brackett says. “It helped them stay loose for the game with Enterprise.” Gunnison Valley won, 5-3. That put Gunnison in a semi-final game against Beaver. The Lady Bulldogs intimidated the Lady Beavers when Emily Brackett stepped up for the first at-bat of the game and knocked the ball out of the park. Gunnison ended up winning 14-2. After losing to Gunnison, Enterprise went into the losers’ division in the double-elimination tournament. They worked way to the top of that division. That meant Enterprise and Gunnison would face each other again in the final game. On the bus ride Saturday from Gunnison to Spanish Fork, the Gunnison girls were uncharacteristically quiet. Brackett was a little worried. It turned out “they were all calm, and when the game came, they were ready to go,” he said. In the first inning, Gunnison put two runners on base. Then Paige King, the third basewoman, brought both of them in with a single to make the score 2-0 for the Lady Bulldogs. In the second inning, Emily Brackett hit the ball over the left field fence. Later in the inning, Halle Bjerregaard, who pitches and plays first base, knocked the ball out of the park, her first home run of the season. That put the score at 4-0 for Gunnison. The third inning was the big one. With one Gunnison runner on base, King hit a home run, bringing in two more runs. Then Emily Brackett hit her second home run, scoring three. That pushed the score to 9-0. Enterprise finally got on the scoreboard in the top of the fourth when Averie Staheli, an infielder and catcher, hit a triple, driving in two runners and bringing the score to 9-2. That put Staheli on third based, poised to score. But when the next batter hit a ground ball, Gunnison displayed the polished fielding that kept Enterprise in check throughout the game. The third basewoman scooped up the ball and threw it to first before either Enterprise runner could advance. 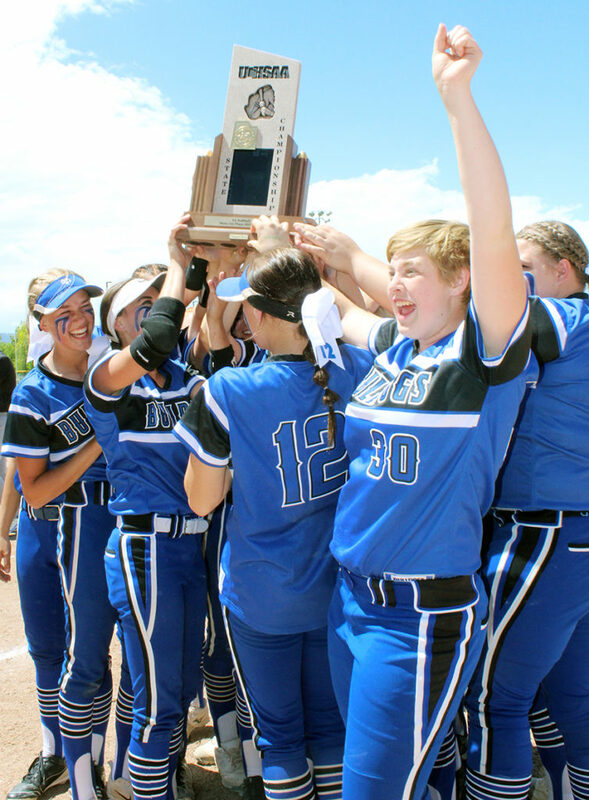 Annalyn Christiansen (facing camera) raises arm in victory as teammates hoist the state championship trophy. In the bottom of the fourth, Gunnison kept hitting. Mckaylyn Edwards hit a two-run homer to put the score at 11-2. With one runner on base, Maddisen Edwards hit a single to drive in the run and bring the score to 12-2. Enterprise failed to score in the top of the fifth. With the third out, the game was over. The jubilant Lady Bulldogs ran onto the field, and a few minutes later, collapsed in celebratory heap near third base. Gunnison’s last state title in a girls sport was in basketball in 1979. Before now, the closest Gunnison had ever come in softball was third place in state in 2001. Emily Brackett, along with Jayda Shaw of Manti and Lanie Gillins of North Sanpete, will play softball at Colby College in Kansas next year. But the softball future at Gunnison Valley looks bright. Two freshmen, six sophomores and seven juniors should be back next year. That includes coach Brackett’s second daughter, Tayler, who batted .608 this year, the eighth highest batting average among all softball players at all high schools in Utah.